A UK, Canadian and Italian study has provided what researchers believe is the first observational evidence that our universe could be a vast and complex hologram. Theoretical physicists and astrophysicists, investigating irregularities in the cosmic microwave background (the 'afterglow' of the Big Bang), have found there is substantial evidence supporting a holographic explanation of the universe—in fact, as much as there is for the traditional explanation of these irregularities using the theory of cosmic inflation. The researchers, from the University of Southampton (UK), University of Waterloo (Canada), Perimeter Institute (Canada), INFN, Lecce (Italy) and the University of Salento (Italy), have published findings in the journal Physical Review Letters. A holographic universe, an idea first suggested in the 1990s, is one where all the information that makes up our 3-D 'reality' (plus time) is contained in a 2-D surface on its boundaries. Professor Kostas Skenderis of Mathematical Sciences at the University of Southampton explains: "Imagine that everything you see, feel and hear in three dimensions (and your perception of time) in fact emanates from a flat two-dimensional field. The idea is similar to that of ordinary holograms where a three-dimensional image is encoded in a two-dimensional surface, such as in the hologram on a credit card. However, this time, the entire universe is encoded." Although not an example with holographic properties, it could be thought of as rather like watching a 3-D film in a cinema. We see the pictures as having height, width and crucially, depth—when in fact it all originates from a flat 2-D screen. The difference, in our 3-D universe, is that we can touch objects and the 'projection' is 'real' from our perspective. In recent decades, advances in telescopes and sensing equipment have allowed scientists to detect a vast amount of data hidden in the 'white noise' or microwaves (partly responsible for the random black and white dots you see on an un-tuned TV) left over from the moment the universe was created. Using this information, the team were able to make complex comparisons between networks of features in the data and quantum field theory. They found that some of the simplest quantum field theories could explain nearly all cosmological observations of the early universe. Professor Skenderis comments: "Holography is a huge leap forward in the way we think about the structure and creation of the universe. Einstein's theory of general relativity explains almost everything large scale in the universe very well, but starts to unravel when examining its origins and mechanisms at quantum level. Scientists have been working for decades to combine Einstein's theory of gravity and quantum theory. Some believe the concept of a holographic universe has the potential to reconcile the two. I hope our research takes us another step towards this." The scientists now hope their study will open the door to further our understanding of the early universe and explain how space and time emerged. Everything is encoded onto the surface of a black hole, and its negative energy density is the universes' dark energy. A hologram is a recording of a light field - i.e. the 2D recording of a 3D pattern of light propagating through space, which is able to transform a second lightfield into a facsimile of the first. The hologram itself doesn't look like anything, it transforms other light into the appearance of the original recorded light. So, if the universe is a hologram, what is illuminating it and where does the light go to be observed? The hologram doesn't necessarily need to record the image of another object - it can have any arbitrary pattern, but the greater trouble is - If we are the hologram, then how can we see ourselves? Some Jayden Smith stuff right here! If read the image and the paper RNP linked correctly (though I have to admit I didn't get very much out of the equations) then we are currently no longer in a holographic phase. 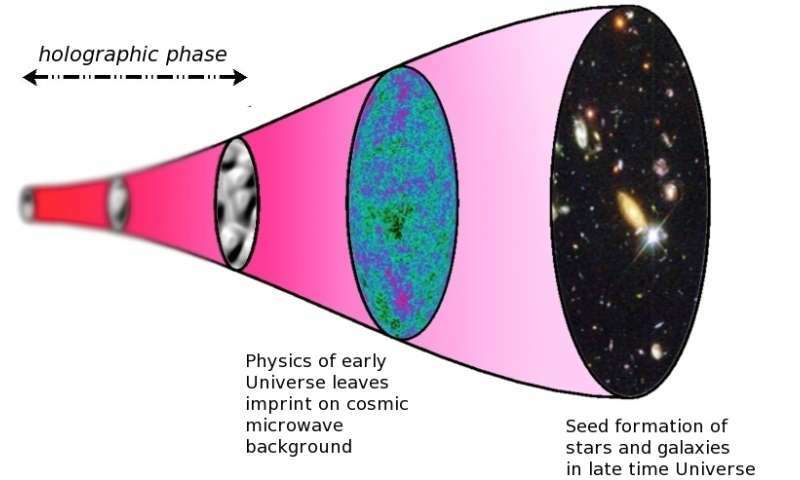 It seems that only the early universe is holographic. Where 'early' is a rather ambiguous term since spacetime seems to be not so easily defined then. can only detect (at least so far) in observations of the early Universe, i.e. the predictions of the holographic model converge with those of LambdaCDM at latter times. If its a hologram then is it writing us or are we writing it? No of course i dont understand it. Gosh darn it, this gives a fair amount of credence to the flat Earther's. I still think our universe is the product of a 4-D star implosion though. Very disappointing that the author mentions Einstein, but give no reference to the Holographic Theory creators, Gerard 't Hooft, Lárus Thorlacius and Leonard Susskind. So, instead of light waves think energy waves and instead of a static hologram, imagine an underlying structure of the universe which, like a hologram, enables interference of these energy waves, which manifests as the universe we experience. @Eikka According to "What It Means to Live in a Holographic Universe" by Brian Koberlein, the holographic universe idea often is misrpresented. It actually means that all the information contained in the 3D universe can be found on the cosmological horizon, and gravity is an emergent property of the information on the horizon. I think that's what he is saying. @sirdumpalot That's how the holographic universe idea originated. Doesn't need to be static. The point of a hologram is simply that its pattern interferes with incoming light so the reflected light replicates the lightfield of some object. The lightfield is the 3D pattern of waves given off by an object, rather than a 2D projection of just the direct rays from the object. imagine an underlying structure of the universe which, like a hologram, enables interference of these energy waves, which manifests as the universe we experience. Yes, but how? If we exist as the 2D surface, if that's "universe", then how are we experiencing the 3D lightfield that is given off by the hologram? How can the hologram "see" itself? Suppose your retina was a hologram - shining a laser light onto it projects a 3D lightfield in space outwards from your eye for others to see. You yourself wouldn't see the picture. It actually means that all the information contained in the 3D universe can be found on the cosmological horizon, and gravity is an emergent property of the information on the horizon. I think that's what he is saying. If I understood the explaination correctly, it's simply saying that all information about the insides of a volume must pass through the surface of said volume, but that isn't the same thing as saying all the information is already on the surface, and only there. What, so gravity and dark energy and higgs fields and whatever else there may be, dont count? CMBR cannot come from some remote physical past which is NONEXISTENT. Well, we suspect the universe started as a singularity, we also know it has a cosmic horizon. Sounds black hole-ish. We also suspect black holes contain information of any object that falls into it, is encoded in quantum fluctuations on the event horizon (is that even a physical thing??) So adding Holographic theory would suggest that our universe is an event horizon. But as others have wondered, WHAT is doing the projecting. Stealing from String Theory, we know gravity is always the odd one out when it comes to forces. String Theory suggests Gravity is so weak, because it leaks across multiple universes. So could gravity be the thing that does the "projection" of the quantum field on the event horizon? Perhaps dark matter is then projections of other universes (parallel) onto ours, but not on our event horizon. All speculative. Thinking out of the box. Oh, I think I'm gonna need help on this one so would appreciate some comments. I seem to be unable to separate what the article is about and that of the Holographic Principle as proposed by String Theory (t'Hooft, Susskind). The paper as given by RNP is not 'layman friendly' (isn't meant to be, I know) and therefore I need time to consult my reference books but it does seem to have a field(QFT)/string field 'feel'. Also, that the t'Hooft coupling along with Loop theories suggests to me, a layman, other than the standard model. Or maybe the matrix had it right all along and this is just a simulation except we aren't being used as batteries because that is just stupid. But all the info could be in coded on 2D surfaces in the form of a computer. "pops" I don't follow. Expanding? Explain how galaxies form. Can many occur if moving toward each other or do we see those as unique. So some can be moving toward each other. Basing our assumption on the Big Bang and Hubble is insufficient. First we must define what we see. Travel, faster than light, is possible. No this is not that. "Pay no attention to that man behind the curtain!" Is there no sense observing and learning in your world? Careful not to take the laziest explanation! It's not mystical-magic, it's science. Of course the following theory will be that this two dimensional universe is actually a projection from a one dimensional reality. Also known as a black hole or singularity. Sort of like the remnants of the spontaneous decay of a massive black hole, like a big bang or something. @big_hairy_jimbo Your comments seem reasonable to me (although that coming from a layman is a low ranking compliment, Ha!). Certainly as far as gravity is concerned it's always bound to be the 'odd one out' because perhaps of our 'defective' perception...is that a reasonable statement?...What I mean is that experiments in machines like LHC etc give our perception a kind of intuitive push about the quantum realm and even the general public are aware of the power of the quantum realm through the use of nuclear power stations and devastating explosions. Our perception of gravity is fed on the macro scale by obvious actions but can hardly be appreciated on the quantum level, at least that is so for the majority. Unfortunately this also feeds those who raise philosophical issues (reality, for example). After all, perception is still part of ongoing research and debates about how our brain functions (conscious/subconscious, mind etc etc) so reality should be left to those in that field. As the clock ticks what happens to the new info? Is it encoded onto the original 2d hologram around the edges? Or does it generate a new surface? In which case the present and past info forms a 3d hologram apparently. As the clock ticks what happens to the new info? Is it encoded onto the original 2d hologram around the edges? Or does it generate a new surface? I visualize it as adding length, width and depth to the 2d. In which case the present and past info forms a 3d hologram apparently. I call it a time "recycle". @Whydening Gyre I note here that 'time' would then seem to have a fundamental or be a fundamental aspect here. I'm not suggesting it's possible, just thinking out loud as it were, but if time travel were possible then the information of the past must be retained. If lost then TT wouldn't be possible as there wouldn't be 'information' to form the past...??? Hmm, even that sounds a bit dubious to me as I suppose one might argue the time might retain 'imprints of information' by a 'predictable deterministic' process instead of chaos processes. If that were the case would it be that entropy was the major player? And how would that fit in or affect your time recycle? If each 'surface' was the result of increase in overall entropy would that suggest expansion and/or acceleration was being 'fueled' by something else? I think I've just fallen into a 'dark something' (DE?) trap. As I say, I'm not putting forward an opinion here just really juggling various ideas. Remember also, that I am an artist (engineer with ADHD), NOT a scientist. I'll come back on again with my first basic by tomorrow. WG , solved any artistic problems? Is your work visible anywhere ? Art doesn't have problems cuz it's the answer. It should be simple and functional. Like my stuff. @Whydening Gyre thanks for the reply. And I am just a layman so you are more qualified than me. That make it sound so noble and fancy...:-) More simply, it is a process of organizing, categorizing and structuring of "observations". You then start connecting dots. I start by trying to keep myself open to as much observational input as i am capable of - even the most obtuse. Then, I begin looking for simple similarities among a collection of differences. Patterns, for lack of better term. BTW - how'd that AG research turn out? There is no a single experimental data, universe is a hologram. All this is made up in human imagination. This idea is epistemologically dead. A hologram requires a light source, we only see light when the spherical field oscillates, this cannot be simulated with a hologram without this source; so, the thought is circular. Illogical! This only states lack of knowledge. OK, here's a question, "Whats the difference between spherical fields and particles?" We have proof of the spherical fields, but no attributes of what describes a particle, boundary conditions, color, density, ... Both are equally likely, however, no empiricism or physical evidence, nor a necessity. So necessary and sufficient conditions for particles have ever been demonstrated or implied logically. Note, we only see the wrinkles in the field; so, define the missing measurement. It's like trying to define the potential of a metal plane in space. Of course it has a potential; but how do you measure it? In other words, how do you measure distant charges that are stationary to you. Or instrumentation capabilities. Your humility does you injustice - I've..
Then, .... can then be generated to reflect them.. Sorry for late reply...PC down...probably in some quantum holograph,Ha...Well, I think I can say the same about your response, humility wise. Like you I too try to keep my mind open and believe me some of my ideas would test you to your limit...but another time eh? With regard to the article I'm having problems, 3D curvature that is. I'm not kidding. The reflection overlaps that which it reflects - but sightly out of sync (dang time). Therefore, MAKING it 3d. See what I mean by "slightly out of sync"? Well, I think I can say the same about your response, humility wise. @Whydening Gyre 'It's tuff realizing you are a reflection of yourself - inside a quasi-spherical reflecting entity..:-)' Now that just isn't fair...I can't read your mind so don't go reading mine, Ha! Sounds like one of the 3D matrices (boxlike) that I'm messing with. 'Mirror image' numbers too. However, I have to say that I haven't met the holographic version...yet. Hyperfuzzy, I noticed my response — "that's what I said" — to what you posted was removed by a moderator. I was not being snide or sarcastic; I was agreeing with you. I didn't intend to come across as offensive. It is imperative to keep an open mind and use only facts, but researchers in any field — from science to theology and everything in between and surrounding and inside and etc — must also be willing to try constantly to reinterpret all available facts. Otherwise, we would still be sleeping in caves and trying to kill each other with the thigh bone of an antelope (the part about the antelope is, if my memory is accurate — it isn't always — from "Ringworld", by Larry Niven; the part about sleeping in caves is me). Credit due, credit given. @Whydening Gyre 'I think you DO meet in in every next moment...' what is the interval to the next moment holograph? @Whydening Gyre 'I think you DO meet it in every next moment...' what is the interval to the next moment holograph? Roughly, 2/3rd's of Planck time-ish...? @Whydening Gyre, yes thought you'd say something like that but what I want to know that no matter how short the interval what is it that connects across that gap to get to next holograph. But even a holograph has some 'thickness' so are they really 2D? @Whydening Gyre, yes thought you'd say something like that but what I want to know that no matter how short the interval what is it that connects across that gap to get to next holograph. But even a holograph has some 'thickness' so are they really 2D? You are correct. The 2d part comes at the "reflector". Reflector is the inside boundary of a - wait for it - giant gravity well. All the activity we see inside (us) is akin to brownian motion on a universal scale. OK, I agree with you, a little, but expand the idea of imagination. Imagination is also what drives schizophrenics mad, it creates playtime for kids; however, imagination without logic is nonsense. cont: By the way, I'm Black in a white world, with the world as mostly non-whites. Nothing offends me, except the never ending ignorance and the refusal to see that the Money Grubbers are a danger to our existence or the closed minds of Universities that teach theory as fact. Give a name to something unknown, or an almost accurate diagram and call this genius. Knowing that gravity is measurable but not where the field comes from; or calling Einstein a genius or Gluons hold the nucleus together. Deny that neutrons are an electron and proton combo. Or call field events "particles" , particle undefined or displayed, never noting that particles don't exist. Call a fast moving proton an anti-electron. etc, etc. imagination without logic. Money grubbers have always been the bane of humankind's existence — I doubt that will ever change, although their influence goes up and down. I'm offended when anyone uses another. I taught at the university level for over two decades, and I never said something was a fact unless I could back it up; at least 90% of my colleagues did the same, regardless of their respective fields. I am disgusted with the other 10% (they don't like me, either, as I never shut up about them). I don't know what to do about them except point them out, and I've always done that. It is not wrong to give a name to something; it is very wrong to ignore something if there's evidence something's there. Give it a name and study it. It could revolutionize the field, or it could be a wrong bit on a data disc, but give it a name and study it, because you won't know, otherwise. Einstein understood Newtonian physics, noticed something a bit off, and said "what if" — that's why he's a genius. I agree that imagination without logic can produce nonsense (not always). I must disagree that imagination is what "drives schizophrenics mad" — schizophrenia is a physical illness that affects the brain, causing delusions and hallucinations. schizophrenia is a physical illness that affects the brain, causing delusions and hallucinations. Correction. You're a Human stuck in an ever changing environment. Don't accept - Evolve. Very well then, if we agree that it is kinetic/reflector based where does the 'change' come from as the next holograph will not be the same as the previous one. And what causes that 'change'. I'll have to look-up 'giant gravity well' as my 'mainstream mind' needs more input, Ha!...unless it refers to gravity emanating from a Brane? Very well then, if we agree that it is kinetic/reflector based where does the 'change' come from as the next holograph will not be the same as the previous one. from the all the "changing" photon input to the "reflector". And what causes that 'change'. Same as regular gravity wells. Ha!...unless it refers to gravity emanating from a Brane? No, gravity only emanates from mass. In our case, the cumulative mass/gravity of our Universe reaches a point (somewhere WAY out there) where - guess what - even light can't escape. Hell maybe eve GRAVITY can't escape it... It forms an "almost" impenetrable event horizon that reflects photons (maybe even gravity waves) back in. @Whydening Gyre Must admit I hadn't thought of a 'gravity accumulation' but wouldn't that accumulation have to be at a single point to have such strength? Oh dear, back to 'living in a BH theory'. Ha, are you a crafty one...? There's an 'element' missing in your comments which I think runs the whole thing...but it isn't mainstream thinking...and I wonder if you are deliberately avoiding using it or identify as be 'change'. Oh well, nice chatting anyway. @Whydening Gyre Must admit I hadn't thought of a 'gravity accumulation' but wouldn't that accumulation have to be at a single point to have such strength? Oh dear, back to 'living in a BH theory'. Ha, are you a crafty one...? Not a black hole, the next fractal level up. Doesn't have the exact arrangement of stuff as our level. There's an 'element' missing in your comments which I think runs the whole thing...but it isn't mainstream thinking...and I wonder if you are deliberately avoiding using it or identify as be 'change'. Oh well, nice chatting anyway. @Whydening Gyre, thanks but '...even way farther out...' isn't that idea 'non-mainstream'? Isn't our universe supposed to make it's own volume in which to expand, that is there isn't 'even way farther out' to observe from? But I do see the point, thanks. Tell you whats missing...not a chance. But I will give a hint... just on the back of an envelope schoolboy stuff...just write a few a few equations from basic physics and I'm sure you'll see what I mean. @Whydening Gyre, thanks but '...even way farther out...' isn't that idea 'non-mainstream'? So what? If it uses mainstream constructs, it has validity. Isn't our universe supposed to make it's own volume in which to expand, that is there isn't 'even way farther out' to observe from? But I do see the point, thanks. Our REAL Universe is even bigger than our imaginations. I keep it simple by visualizing the one which we exist within. Tell you whats missing...not a chance. But I will give a hint... just on the back of an envelope schoolboy stuff...just write a few a few equations from basic physics and I'm sure you'll see what I mean. Which ones would you be referring to? I don't do equations, I do visual constructs. Loops occur, they're never exactly synchronous. The real problem lies within our ability to adapt our frame of reference. The energy of mass times C/2 takes on different outcomes if we measure mass in a differing specific volumetric "localities" . (reference frames). IE - the mass (and volume) of an atom versus the mass (and volume) of a galaxy. We miss the step of saying the mass of a specific volume. Our Universe does not subtract, multiply or divide. It only ADD's. I like to assemble, not dissect. @Whydening Gyre Okay, I understand your comments. '...they're never exactly synchronous...' Yep, synchronous or not would be one way of putting it...now use everyday common language to say that. Ancient Egypt, an economy based upon Human Rights, had no currency. See Translation from ancient hieroglyphics in stone! By the way, there existed a dichotomy of a person as mind, body, and spirit. These also had defined attributes, such as the spirit in conversation, or trade. Example: A negotiation leaves everyone smiling; best, "the more you serve the better." E = MC^2 is bogus, not logical, not true, a measure of the imaginative quanta. E = MC^2 derived from Planck and De Broglie, not from M = Mo/Sqrt(1-v^2/c^2), do the derivatives. It's insane! Plus the speed of light, original wavelength divided by the measured period, simple speed of the wavelet, which is a wrinkle in the spherical field of charge, and the spherical field is from the center to infinity updated at the speed of light relative to the center, this is charge and has no mass and is the source of Newton's gravity. They do the photon mash? How bout a little input - where are you trying to direct this? Hyperfuzzy, any response to you would require that we discuss (and, most likely, argue heatedly) over history, sociology, psychology, psychiatry, politics, linguistics, computation theory, information theory, and the mathematics of probability and statistics. I responded with my comment about schizophrenia for the sole reason that it seemed to me that you misunderstood the illness; most (not all) people do. Perhaps I was mistaken; if so, I apologize. I now think that I should not have responded to your comment about schizophrenia, as conversations about these topics rarely end well. I spent far too much of my youth fighting; I don't want to waste my old age the same way. The concept I have been pondering over for the last few days is that we created the universe and life as we know it, and we created it for us. That we are an energy life force, possibly the only form of life, and through a desire, we created our universe and human existence to live and experience many lives over thousands of years, as an eternal conscious life form, time would be meaningless and is as thought, just an illusion. Elements of life and of what we believe and things we take as history are nothing more than a fabrication that we generated to give us a sense of truth, a belief in our perceived reality. To me this makes plausible sense, it makes every thing fit ? @Whydening Gyre 'directing...' You mentioned earlier about seeing my 'various posts'. Perhaps a look there would remind you. Am reading an interesting article by Ione Parkin concerning Art meeting Science...interesting. Science dissects. Art puts it back together, again, utilizing the input provided by that dissection. My wife works with the impaired. She knows far more than I. I simply follow advances in genetics "switches". Gleadd - way too over the top. We are merely the product of action/reaction. HF - the barbarians did it right. Not a lot of thought and ethical interpretations - just action. Pro-active, yes. But they knew their "pro"s and and didn't waste so much time equivocating. They were in the business of surviving and thriving. Are we talking holographic Baboons here? Bit off topic isn't it? OK, I'm not even going to try to justify barbarism. Survival is much easier with cooperation. How would you look for a result like that? And how/why did they all die? In battle with another troop?Poisoned? Tired of incessant do this and don't do that, bored to death? My question, same. The article gave some genetic specific illness. I didn't buy it. I conjectured that the study of removing aggressive males from a troop was the experiment. Was there a quoted study to back up the article? And now, can we please get back to the topic of "evidence for holographic universe(s)"? Okay, first... no apologies necessary. You provided evidence. Those Sapolsky-Share links were interesting in that they remove the "internet urban myth" tag. Actually, I found the tale to be ironically entertaining. I wonder if anyone is still researching the "Garbage Dump Troop" at this time. I think it was a discussion upon the origins of logic, i.e. the point I was going to: logic without imagination; case 1. Logic with imagination, imagination without logic, ... No imagination without logic is always nonsense; for logic must be used to define a reference of measure, i.e. empiricism applied with logic based upon what is known and not upon what is imagined. I think there's video. Somewhere. It is, as yet, unknown whether information is encoded on the surfaces of black holes, but there is enough evidence to keep investigating that hypothesis. There is, however, overwhelming evidence that black holes exist. It is also true that overwhelming evidence is not certainty, but to convince me, and a whole lot of other people, that black holes do not exist will require more evidence that they don't exist than the amount of evidence that they do (if the evidence for both sides is the same, then it's time to look for other possible explanations). Each form of matter-energy that we know about, unless it's confined to atomic nuclei, responds to gravity. Electromagnetic radiation, magnetism, electric charge -- each responds to gravity, because each is transmitted by photons, and photons respond to gravity; there is overwhelming evidence for this, as well. All this overwhelming evidence can be found in physics books. I made a mistake in my most recent post. I wrote, "if the evidence for both sides is the same, then it's time to look for other possible explanations". It is always time to look for other explanations, especially among theories that have been discarded. Thank you, Lindsey — most sincerely.